Well after a number of targeted posts I want to give an overall summary of our trip. We arrived at Old Moses gate of Mt Kenya last Saturday only to find that the the Kenya Wildlife Service is in the middle of paving the road so we were not allowed to drive on it. This meant 8km of hiking that we had not included in our timing. Additionally, Steve already had quite a severe cold and was looking pretty bleary so it was slow going. Luckily a truck from the paving company came by we flagged them down for a trip up the road to our first camp: Old Moses (3300m / 10,800ft). The night was very clear and fairly cold and our adventure had begun. Our first real day of hiking took us 6km to the Liki North Hut (4000m / 13,100ft). The weather was beautiful and since Liki North Hut is a slight variation to the popular Sirimon route we did not see any other hikers. Along the way we had time to walk out on exposed ridges so that the GPS and weather station could get a GSM signal and upload their data. 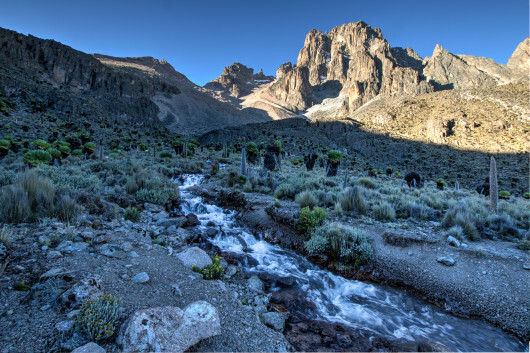 Hiking up the shoulder of Mt Kenya. On Monday I planned to hike from Liki North to Austrian Hut with a break at Shiptons which turned out to be a rather aggressive schedule. We eventually got to Shiptons (4200m / 13,800ft) around 1pm but since Steve’s cold was still really hampering his efforts Jeff and Steve stayed at Shiptons to rest while Paul, Killah, Fender and I went on to Austrian Hut. Most hiker’s summit the non-technical peak, Lenana with an early morning start from Shiptons and then return to Shiptons for breakfast before heading back out of the park. Our schedule had us spend a night at Austrian Hut (4800m / 15,750ft) so that Paul and I could do the technical climb up Nelion with the GPS picoBRCK while Killah and Fender set up the Weather Station picoBRCK. At almost 16,000ft, Austrian Hut is not an easy place to be, never mind get to. The ascent from Shiptons is remarkably steep and there are a number of ridges to traverse as one goes around the mountain. 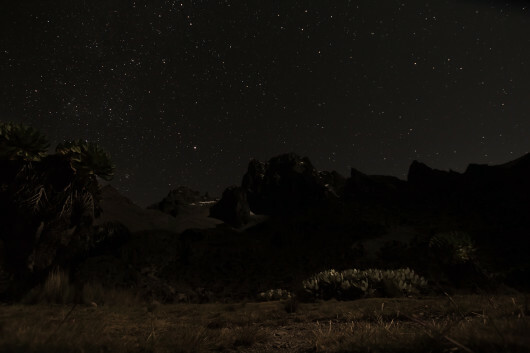 During previous ascents of Mt Kenya I have spent some time at Austrian Hut and I tried to brief the guys that this would NOT be a pleasant night. Half way to Austrian Fender really started to slow down. He had good spirits and a clear voice but simply said his body couldn’t go faster. 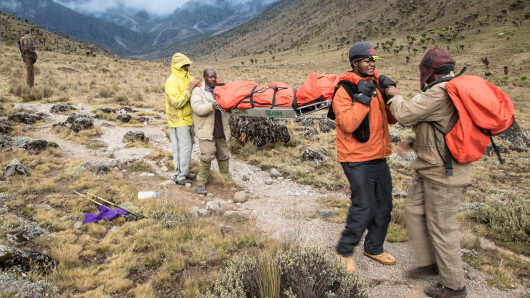 Meanwhile one of our porters had fallen and injured himself the previous day so our other porter was helping him get down to the gate after delivering the Weather Station and technical climbing gear to Austrian Hut. We passed them coming back from Austrian and I asked Fender if he wanted to go with them back to Shiptons to stay the night. However, because he had just done such a steep climb he was adamant that he did not want to go back down. I definitely could have pushed harder but, naively, I allowed him to keep coming. We arrived at Austrian Hut around 7pm and Fender and Killah were so exhausted that they fell into bed immediately. Paul and I stayed up prepping for the next days climb and making supper but only Killah managed to sit up for about 3 minutes to eat and then went back to sleep. It was a restless night for all of us and I knew that Fender was awake for most of it based on his tossing and talking to Killah. Paul and I got out of bed at 4AM and were gone by 5:15. You can read Paul’s post about the climb but suffice to say it was absolutely picture perfect. The weather and rock conditions were ideal and our guide, Kim, knew the route like the back of his hand. We arrived at the the summit of Nelion (5188m / 17,000ft) just in time to hear Steve (who had hiked from Shiptons that morning) loudly celebrating his summiting of Lenana (4985m / 16,350ft). Meanwhile Killah was watching us as he set up the picoBRCK Weather Station and confirmed with the team back at the office that everything was working. 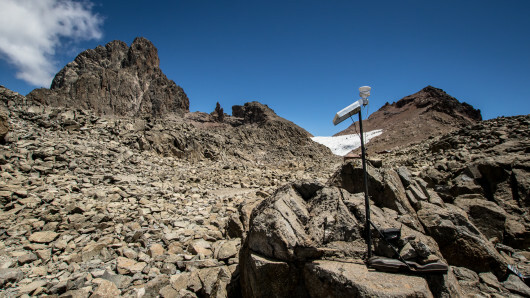 The picoBRCK Weather Station with Nelion (left) and Lenana peaks in the background. 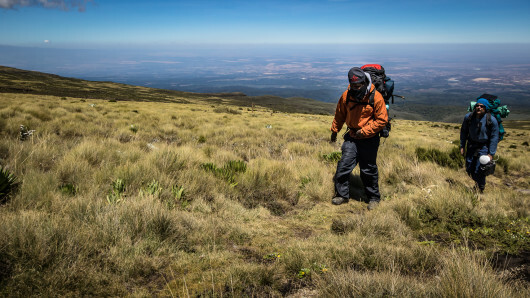 Our porter took the Weather Station and climbing gear down to the next camp Mackinders (4200, 13,800ft) ahead of us and Paul and I followed with our guide from Nelion. When we got to Mackinders we learned that Fender was still doing poorly and so the group had continued on with Fender on a stretcher with the KWS rescue team. Steven was still going slow and Killah had now been called upon to help carry Fender so they left Killah, Fender, Steve’s packs as well as the weather station at Mackinders. I did not want to leave Jeff to deal with all the decisions and logistics so Paul and I had a 5min break and kept doing. It was dark by now so we just hiked by the light of our headlamps. We could see a group far off in the distance and after a few hours we eventually caught up to the whole group including the BRCK team and a number of stretcher bearers who had been called up to help with Fender. We now had weak GSM reception every now and then and so I started contacting people and making hospital arrangements. Steve (orange jacket) and Killah (green/yellow jacket) helping to carry Fender down to a lower altitude as quickly as possible. We continued one for about 2 hours together but the stretcher carriers were really getting tired and the path was getting incredibly rocky so the chance of them dropping Fender was huge. Fender was coughing badly and groaning a lot but seemed to be lucid enough and getting impatient with all the breaks. I knew we had dropped a lot of altitude and so I asked him a couple of times if he wanted to try walking and he always said yes. I introduced this idea to the head KWS medic and they were glad for the chance to stop carrying him. So I gave him my boots and some drink and he went off being held up by our porter and the head medic. They moved really quickly after this and we were barely able to keep up. At this point Steve had now dropped far behind. Fortunately Paul and our guide chose to stick with him while Killah and I stayed with Fender. We got to Met Station around 12am where a KWS truck was waiting. I arranged for some porters to get the extra bags and after some time we eventually left for Nanyuki. Fender was still mostly out of it and even puking at times. About an hour down the road the truck broke down because of lack of brakes and we waited an hour for another vehicle. We arrived at the gate only to be met by the same truck which was now “fixed”. We headed off to Naro Moru to drop off some porters and finally got to Nanyuki Cottage Hospital around 2 or 3AM. Fender’s O2 was 69% so they immediately admitted him and started him on IV and O2. Killah and I simply lodged in a room down the hall and got to bed around 4AM: it had been a full 24hr day for both of us. Meanwhile Steve and Paul had showed up at Met Station around 2am in the morning. Another KWS group had also met them along the way and encouraged Steve to keep going. So Steve, Paul and Jeff slept at Met Station. The nurse woke us at 6:30AM and couldn’t believe we were still sleeping even though she knew we had got to be at 4AM 🙂 We talked to the doctor in the morning and Fender officially diagnosed him with pulmonary edema. The doc was pretty clear that he’d probably be OK by noon that day but when they checked his O2 it was too low and a chest x-ray revealed that he still had fluid in his lungs. The rest of the group headed home on Wed afternoon after a nice lunch while Fender and I spent one more day at the hospital to allow him to fully recover. 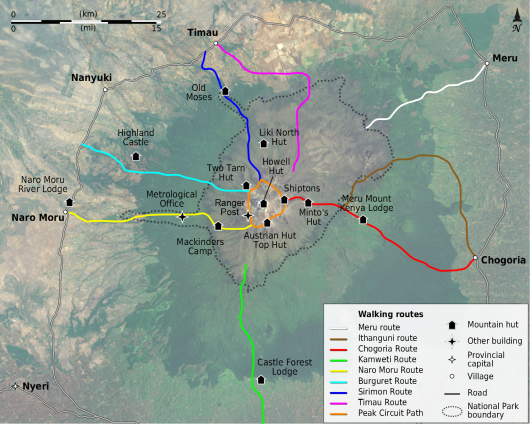 And that was our Mt Kenya expedition. The day we arrived in Nairobi we learned that a group of university students, that had started with us from Old Moses, also had a member fall ill with pulmonary edema. Unfortunately they were caught in a storm on the other side of the mountain from us and were unable to descend to a lower elevation or get to a hospital. She passed away at Shiptons that night. Our thoughts and prayers go out to her family and classmates.